Description: [kah-choh-kuh-VAH-loh] From southern Italy, caciocavallo (meaning ‘cheese on horseback’) is said to date back to the 14th century, and believed by some to have originally been made from mare’s milk. Today this cheese comes from cow’s milk and has a mild, slightly salty flavor and firm, smooth texture when young (about 2 months). It is one of the pasta filata types of cheeses (like provolone and mozzarella), which means it has been stretched and shaped by hand. As it ages, the flavor becomes more pungent and the texture more granular, making it ideal for grating. Caciocavallo is also available hand smoked, never using liquid smoke but using the old traditional methods of hay/straw. Caciocavallo di grotta is aged in natural caves for at least 6 months. The rind is thin and brown to light brown in color with the inside resembling the color of straw. The cheese is hard and compact with a long, earthy flavor and a buttery, stony and slightly picante aftertaste. 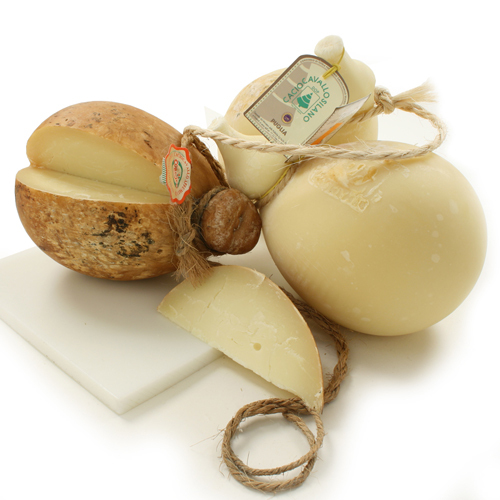 Natural caciocavallo, smoked caciocavallo and caciocavallo di grotta are all available in 1.5 kilo/3.3lb pieces. The picture to the right shows natural caciocavallo on the right and caciocavallo di grotta on the left.